The problem with using conventional tillage practices for onion production on muck soils is that it results in the subsidence of muck via wind and water erosion and oxidation of organic matter at a rate of one foot every 10 years, which is not sustainable for preserving these non-renewable natural resources for long-term productivity. Onions are one of the most valuable vegetable crops produced in New York State with the majority of the 13,000 acres being grown on muck soil. 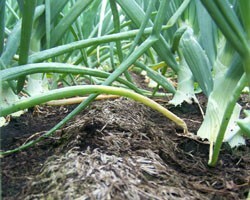 Producing onions using conventional tillage practices results in degradation of soil health and increased subsidence. This leads to increased fertilizer and crop protection chemical input to maintain productivity, resulting only in increased subsidence and declining productivity at ever increasing costs. It is a scientifically proven fact that wind and water erosion, and subsidence decreases as ground cover increases and cultivation decreases. In this project, we developed and evaluated growing onions from direct seed in reduced tillage production systems using oat and wheat cover crops on muck soil on a commercial scale. This was the first attempt of its kind, and a success with the minimum tillage systems producing comparable yields to the conventional system, having reduced onion thrips, bacterial rots and Botrytis leaf blight, and significant reductions in soil compaction and reduced wind erosion compared to the conventional system.